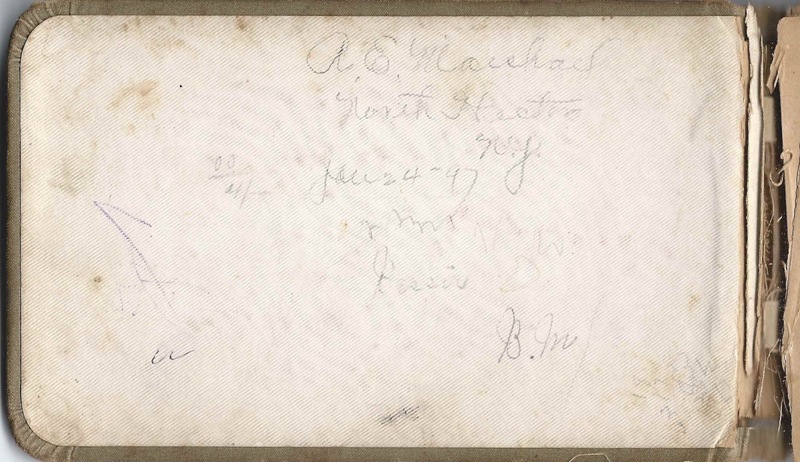 1880s-1900s autograph album of Robert Edward Marshall of Hector, New York, and Valois, New York. 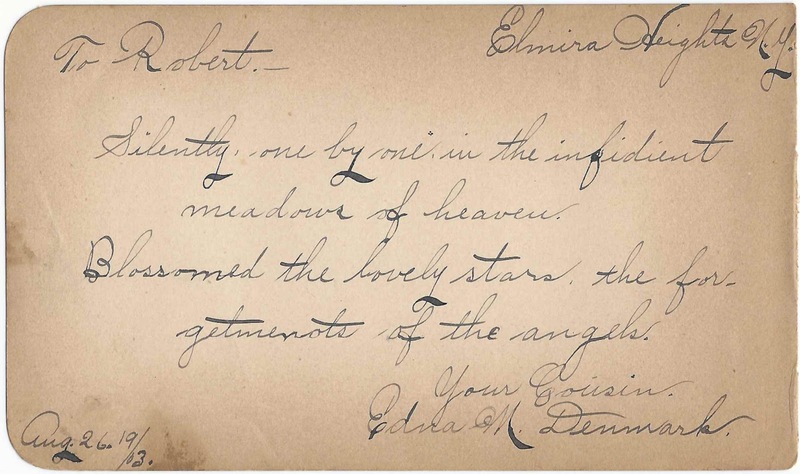 The album is approximately 7" x 4-1/4" and contains the sentiments of 25 of Robert's relatives, friends and schoolmates. 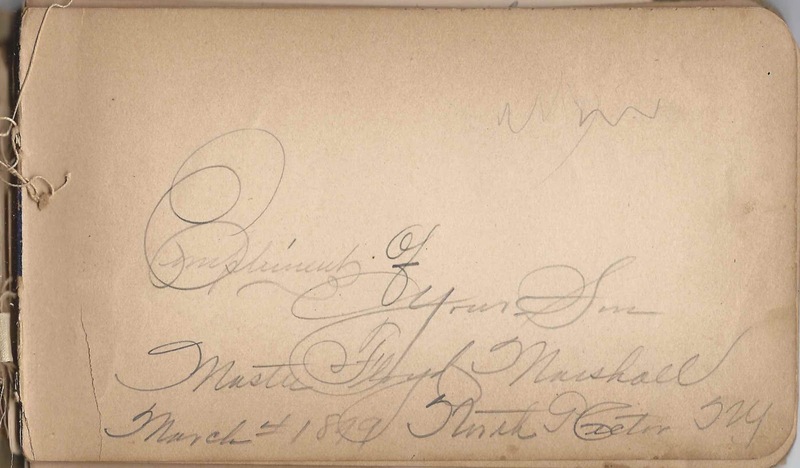 An alphabetical list of the signers appears at the end of this post. Robert Edward Marshall was born 29 June 1871 at North Hector, New York, or Covert, New York, the son of Freeman and Marianne Charlotte (Porter) Marshall, "Lottie", immigrants to New York from Lincolnshire, England. Two people who expressed a relationship with Robert were siblings Edna M. Denmark and Harold Denmark, whose parents were Monroe and Addie Denmark of Elmira, New York. 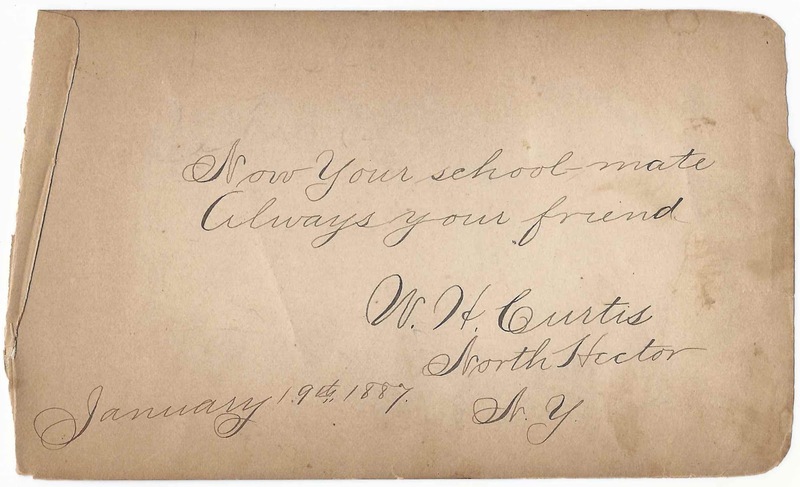 Robert was educated at North Hector, New York, as evidenced by the page signed by W. H. Curtis of North Hector, New York, on January 19, 1887, who called himself Robert's schoolmate. On 13 March 1891 in New York, Robert Edward Marshall married Fannie Hinckley, daughter of Eliel M. and Agnes Lula (Sanders) Hinckley. 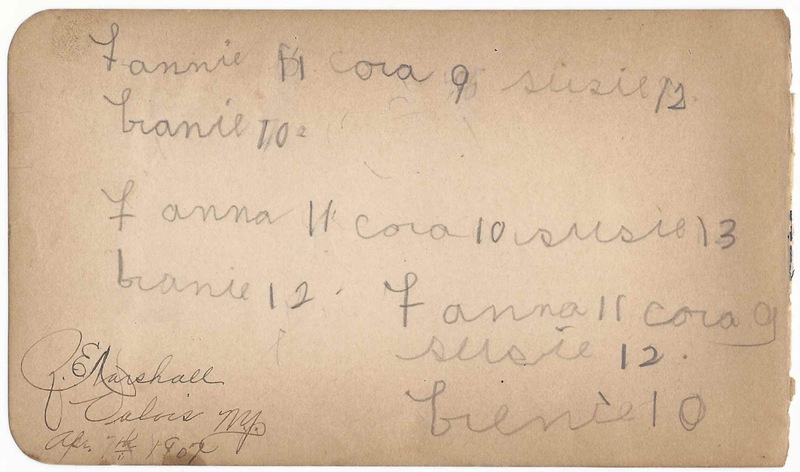 Fannie was bornn 27 August 1871 at North Hector, New York. Bessie Marshall, born 25 July 1896 at Valois, New York; died in 1958. Floyd David Marshall's name appears on two pages in the album, but they were apparently signed by someone else, presumably Robert or Fannie, as Flyd would have been too young. 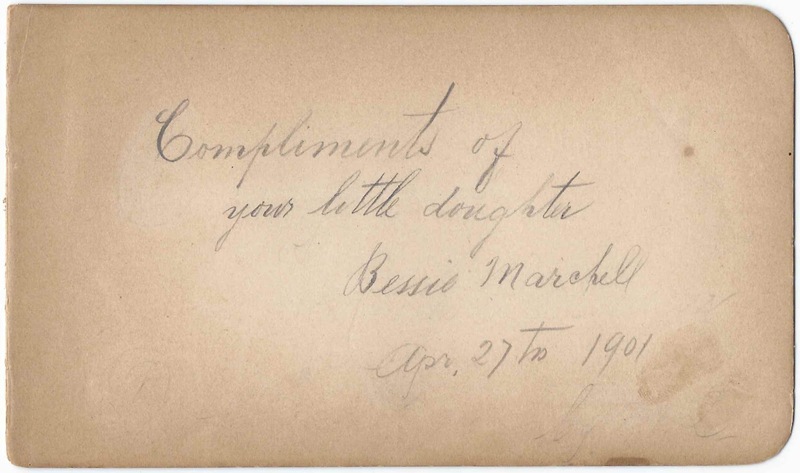 Someone also signed a page for Robert's daughter Bessie on April 27, 1901. Robert Edward Marshall died in 1931 at Montour Falls, New York, and Fannie in 1970 at Watkins Glen, New York. The page below contains the names of children, who may have been relatives or neighbors. Two pages contained a note referring to the death of the signer. 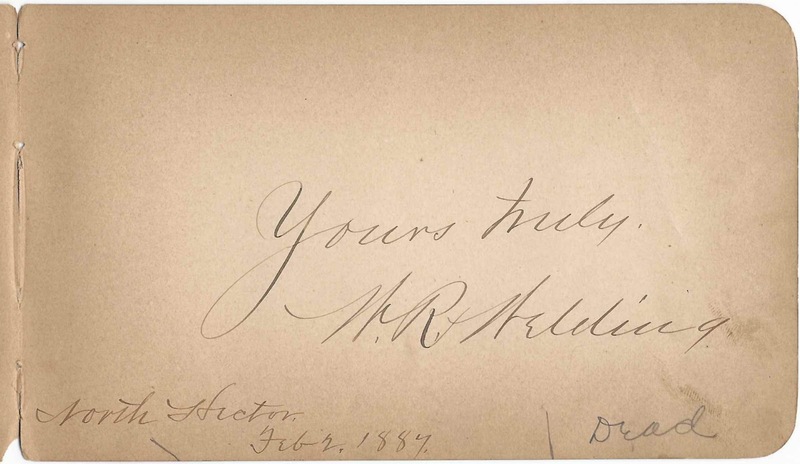 W. R. Welding signed a page at North Hector, New York, on February 2, 1887. 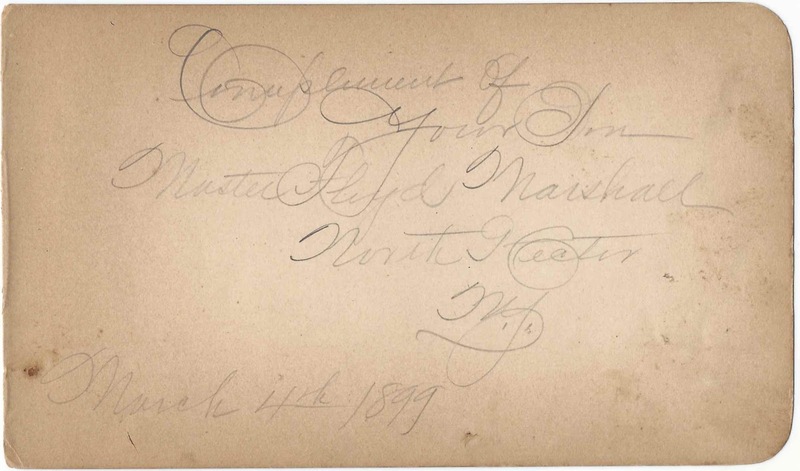 He was Postmaster William R. Welding, who died at the age of 41 on April 8, 1894. Someone, presumably Robert, added the note: "Dead". 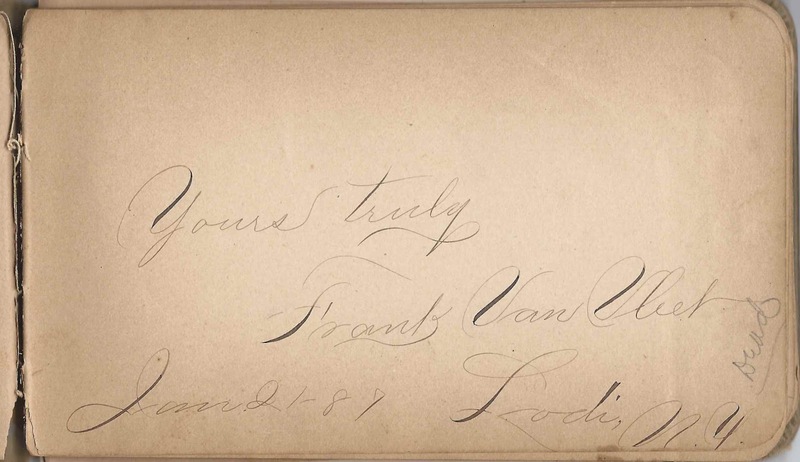 Frank Van Vleet of Lodi, New York, signed a page on January 21, 1887. Someone, presumably Robert, added the note: "Dead". When purchased, the album came with some loose pages from a more contemporary album from the 1930s. I don't know if the two albums have a relationship or not. The pages were addressed to a Jane/Jayne from people with surnames of Wallenstein, Manger and an undecipherable one, possibly Hardi, and a page signed by "Cousin Barbara". 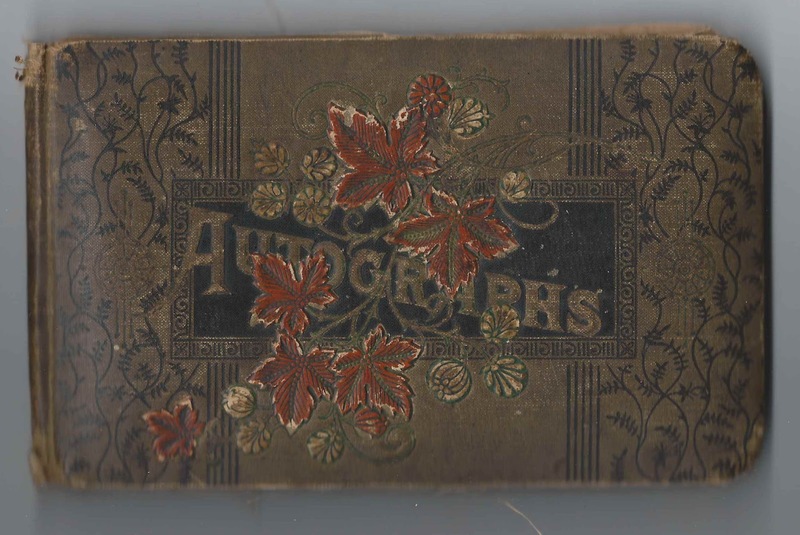 James Brogan, signed at North Hector, New York, on December 28, 1890. Middle initial might be F or H or ? 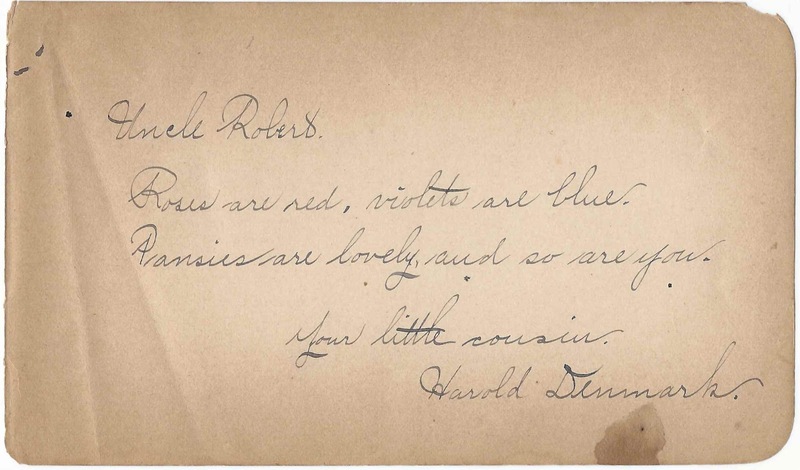 Harold Denmark, inscribed to "Uncle Robert... from your little cousin"
Willie Stone, signed at Elmira, Chemung County, New York, perhaps on New Year's Day 1890, judging from the message. Frank Van Vleet of Lodi, New York, signed on January 21, 1887. Someone, presumably album owner Robert Edward Marshall, wrote: "Dead"